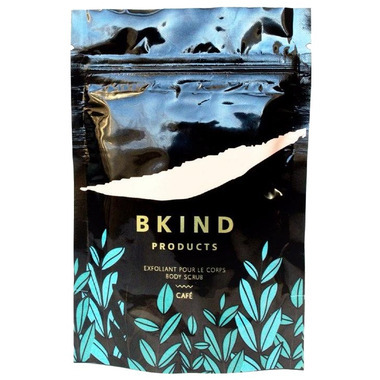 Please Note: BKIND has updated packaging for this item! The product inside has not changed, but you may receive either of the shown images while we update our inventory. 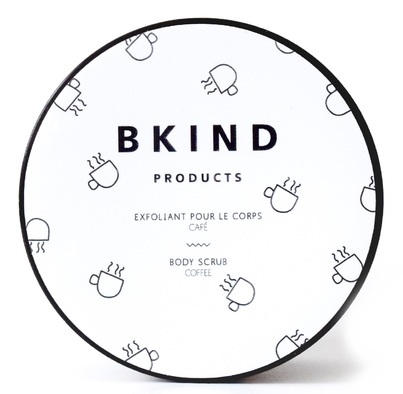 Just as your morning coffee, the BKIND coffee and peppermint body scrub is the perfect partner to kick off your day. Made with Fairtrade and organic coffee from the Montreal based company Café Rico, it exfoliates your skin gently, helps stimulate blood circulation and helps to firm your skin. This product also contains volcanic pumice stone, well known for its exfoliating and skin-softening properties. Sea salt will naturally detoxify and absorb your skin’s toxins. Finally, the added peppermint oil creates a cooling sensation on your skin. Together, these natural ingredients are combined to leave your skin perfectly smooth, refreshed and moisturized at the same time. Suits all skin types. To use: Mix a little quantity of our Coffee and peppermint body scrub with water, and rub it on your entire body, especially on the dry skin areas. Ingredients: fair-trade coffee from Café Rico, sea salt, volcanic rock and peppermint. This scrub smells delicious, and leaves my skin feeling really soft afterwards. However, it is basically just ground up coffee grounds so it is so messy. Definitely over priced for the product since I could just make it at home, and it gets everywhere in the shower because itâ€™s dry and not in the form of a scrub paste. I like this product, it works well and smells good, but it stains my shower floor of course. That is the only set back.